Make her a queen for a day with breakfast in bed, a lovely bouquet, and a special gift! Luckily The Flower Pot is here to give you ideas for all those things. Those of you who are unsure about what special breakfast you could make for mom, fear not! After scouring the web we found these great options that include potato breakfasts, egg breakfasts, fancy breakfast sandwiches, as well as pancakes and pastries. Of course, we didn't have to look far for bouquet ideas: The Flower Pot's got it covered. 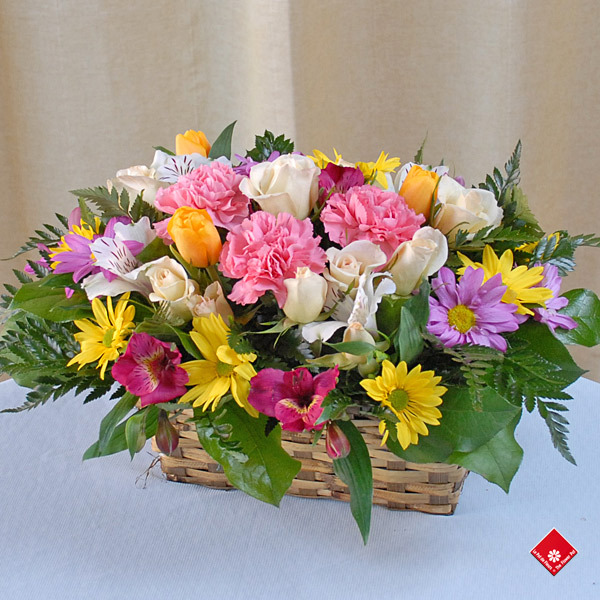 The beautiful English garden style flower basket pictured here would be ideal for mom on her special day. She could use it as a centerpiece for her dining room table, as a lovely windowsill ornament, or perhaps a decorative touch to a side table or coffee table. We have other flower and gift ideas in our Mother's Day section. For a personal touch, we thought that a DIY gift might be in order. Pinterest is a wonderful tool for DIY ideas, and The Flower Pot discovered this page, which is full to bursting with lovely ideas that will make mom smile for years to come. If you have any questions or requests, don't hesitate to call us at 514-938-1234, visit our website, or drop by for a visit!